Bernard Tomic's run at the Australian Open delighted the home crowd in the first week of the Melbourne tournament. As the semifinal line up at the Australian Open takes shape, I've taken a look back over the first week of the Melbourne Park tournament to pick my top ten moments of the event so far. Fernando Verdasco of Spain against Janko Tipsarevic was one of the highlights of the opening week in Melbourne, even if the Serb tanked the deciding set. World number 49 Tipsarevic played some great tennis and had three match points as he looked to cause the biggest upset of the men’s second round. Somehow the struggling ninth seed Verdasco managed to save them all before winning 6-0 in the fifth. Though world number one Rafael Nadal scored a straight-sets victory against Bernard Tomic, the Australian made it a very interesting third round encounter. 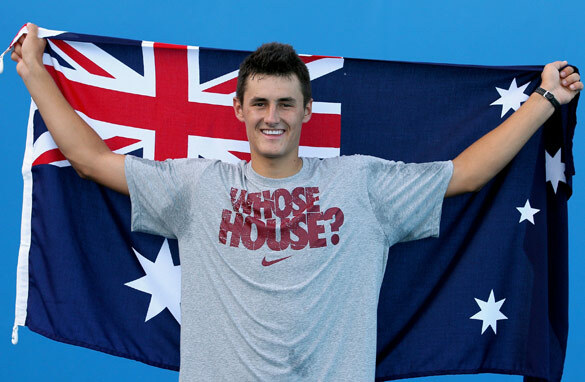 The 18-year-old Tomic made nine-time grand slam winner Nadal work hard for the first time in the tournament. The youngster has a unique game and an abundance of confidence and, unlike so many, he did not seem particularly overawed as he battled the Spaniard in the Rod Laver Arena. It was a fun match to watch and a good test for Nadal, who passed with flying colors. We recently ran a piece on CNN’s tennis show "Open Court" in which many of the current top stars were asked to name a player who could make a splash this year. The general consensus was Marin Cilic, and the big-hitting Croat seemed to come of age as he battled past the Wimbledon marathon man John Isner. Cilic has shown so much potential in the past – but on occasion, unwillingness to put his heart, body and soul into it. This match was different and maybe the start of something really special. While no-one really thought Gilles Simon would beat defending Australian Open champion Roger Federer in the second round, all signs pointed to a close match as the Frenchman had won both their previous encounters. When the Swiss breezed through the first two sets, it seemed certain it would be over in a matter of minutes. But Simon fought back brilliantly and made this into a terrific encounter – one which the 16-time major winner Federer was extremely relieved to pull-out in five. The first-round meeting between David Nalbandian and Lleyton Hewitt had all the makings of a classic. Both men were in form and had a history. Hewitt had won the previous weeks Kooyong Classic exhibition tournament while Nalbandian was the beaten finalist in Auckland. And the rematch of the 2002 Wimbledon final did not let us down. The final battle of the night on the opening day was a nerve-wrenching, gut-busting affair. It was won, a little surprisingly, by the much-less supported Argentine in a little under five hours. The women’s side of the draw has also seen its fair share of memorable matches. The clash between Venus Williams and Sandra Zahlavova will arguably be remembered for the former world number one’s "interesting outfit" (a yellow lattice top with a tie-dye skirt, which she said was influenced by the rabbit hole in Alice in Wonderland!) But it should be remembered for the way the fourth seed came back from the brink. Having lost the first set on a tie-break, the American hurt her groin early in the second and shrieked with pain. It seemed as though her tournament was over, but the seven-time major winner bravely fought through it and advanced 6-4 in the third. The second seed Vera Zvonareva had a very good 2010. She reached two major finals, neither of which she handled particularly well. I feel, the Russian does have a slam title in her, she has all the ingredients and just needs belief. Her encounter with Serbia’s Bojana Jovanocski could have been a match in which the Russian lost her head and with it the match. But after being battered in the first set, Zvonareva remained calm and battled back, eventually winning in style. Afterwards, she gave a very impressive post-match interview to Pam Shriver which revealed the depth of her character and her intelligence. I’m a fan! Top seed Caroline Wozniacki had a tough time in the run-up to the first tennis major of the year. Questions about her number one status, without a grand slam title to her name, have been ongoing and she really struggled in her warm-up tournaments. One of which included a defeat to Dominika Cibulkova in Sydney. Wozniacki certainly got her revenge and played a very impressive fourth round against the tiny, but feisty Slovakian. A third round battle between two former major winners didn’t go the distance but every point was a battle. On paper Justine Henin was supposed to win, but armed with a new coach and a new fitness routine, the incredibly fit Svetlana Kuznetsova came through 6-4 7-6. Both played aggressive tennis, the Russian slightly more so, and that was the difference as she overcame the nerves to beat the Belgian for only the third time in 19 meetings. It can’t be easy to have the majority of the crowd against you, as Petra Kvitova did when she played local golden girl Samantha Stosur in round three. The fifth-seeded Australian was expected to do very well after reaching the French Open final last year, and it didn’t seem as though the pressure of expectation was getting to her. Kvitova, however, played a great match. It was not extraordinary and she did not pull off incredible shots – it was just measured tennis and she played well within herself. The 20-year-old Czech, who made a name for herself by reaching the 2010 Wimbledon semifinals, is certainly one for the future. She might well be one for right now! Roll on Zvonareva, what a great game. I agree with you Candy. Zvonareva does look like a very good player. Let's hope that is not the kiss of death! What a great first week of tennis, please do a top 10 for week 2. Watching everyones,s progress with great interest but I am scared to mention any one name as they would surely lose next round. Keep writing. We love your blogs. Great summary, Candy, Looking forward to a summary of week 2! Exciting stuff. I must admit. Everyone is constantly talking about Federer and wheather he still 'got' it or not. I think that discussion is far more suited to Roddick and Hewett. Their latest results proves my point. It seems that every game is a stuggle to win. Bernard Tomic indeed gave Nadal a run for his money-great game to watch. I think it is only a matter of time before Caroline Wozniacki wins her first grand slam. I think it will be a great final if Wozniacki and Clijsters meet in the final. ...I don't even want to comment on Venus's outfit! The Aussie Open is becoming very interesting – Nadal out, Li Nah in the final against Clijsters. The next couple of rounds are going to be very interesting. Sorry to hear Henin has had to retire from injury, but a damaged elbow is not going to go away. Li Na will be women champion!! !